6/30 7:30 First Floor Booths SOLD OUT! For nearly 25 years, Acoustic Alchemy has pushed the limits of the acoustic guitar’s potential by embracing a spectrum of musical styles ranging from straightahead jazz to folk to rock to world music and beyond. In the two and a half decades since their earliest recordings – despite a tragic setback in the late 1990s and the inherent challenges of the 21st century music industry – the group has assembled and sustained a vast and loyal following that stretches well beyond their U.K. origins. The band’s story begins with two guitarists, Nick Webb and Simon James, who recorded a self-financed, self-produced album in the mid 1980s entitled Acoustic Alchemy. Shortly after the release, James left the partnership to study flamenco guitar in Spain, leaving Webb to promote the record on his own. Webb turned to a rock guitarist named Greg Carmichael, whose background complemented his own – Webb had studied jazz at Leeds College of Music, while Carmichael had studied classical at London College of Music – and the two assumed the name of Acoustic Alchemy. After two more records on MCA (Neutral Elements in 1988 and Blue Chip in 1989), Acoustic Alchemy moved to GRP, which would be their home for the better part of the 1990s. Reference Point, released in 1990, was nominated for a GRAMMY(r) Award, and marked the beginning of a successful run on GRP that included Back on the Case (1991), The New Edge (1993), Against The Grain (1994) and Arcanum (1996). 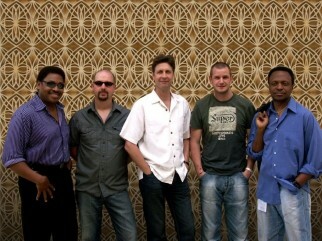 Positive Thinking (1998) was to be Acoustic Alchemy’s last recording with Webb, who had been diagnosed with pancreatic cancer at the outset of the project. His condition worsened to the point where he was unable to put in the studio time and appear on any of the tracks. He died in February 1998, and the album was released later that year. Webb’s death left the future of the band in question. At the time, the group consisted of the two acoustic guitarists backed by electric guitar, bass and drums. Gilderdale, who was playing in the electric guitar slot at the time, expanded his technical skills and repertoire on acoustic guitar and stepped forward to take Webb’s place alongside Carmichael at the front of the band. The band moved to EMI’s Higher Octave label, where they released a short string of successful albums, beginning with The Beautiful Game (2000), an album that didn’t shy away from experimenting with new genres. The Beautiful Game also introduced keyboardist Anthony “Fred” White to the band lineup. The GRAMMY(r)-nominated Aart (2001) is their biggest selling album to date, and includes assistance by saxophonist Jeff Kashiwa. Radio Contact (2003), the band’s final release on Higher Octave, is the first in their discography to include a vocal track – “Little Laughter,” performed by Joe Harrop. Four years in the making, Roseland is Acoustic Alchemy’s newest recording. The album was self-produced in Gilderdale’s home studio in York, England (with some post-production in London and Germany), and released on the band’s newly formed label, Onside Records. Roseland is being licensed to U.S.-based Heads Up International, a division of Concord Music Group, and is scheduled for release on September 27, 2011.